In 1985 the Callie family expanded the business into the wide world of pretzels. 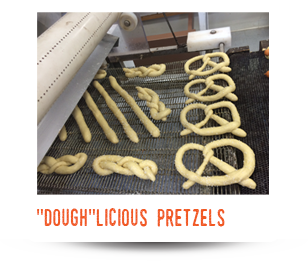 Located just 3 miles south of the candy store, Callie’s Pretzel Factory takes the art of pretzel-making to a new level. Soft pretzels come on sticks, wrapped around hotdogs, and are transformed into pizzas. The list goes on and on. If you can imagine it – we can make it. Callie’s Pretzel Factory is also home to the “Lefty Shop,” a gift shop dedicated to left-handers. Here you’ll find a variety of items designed specifically for lefties, including notebooks, scissors, mugs, and even potholders. 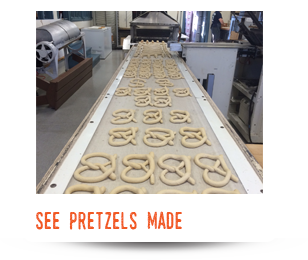 Visitor’s tip: The best time to see pretzels being made is first thing in the morning.